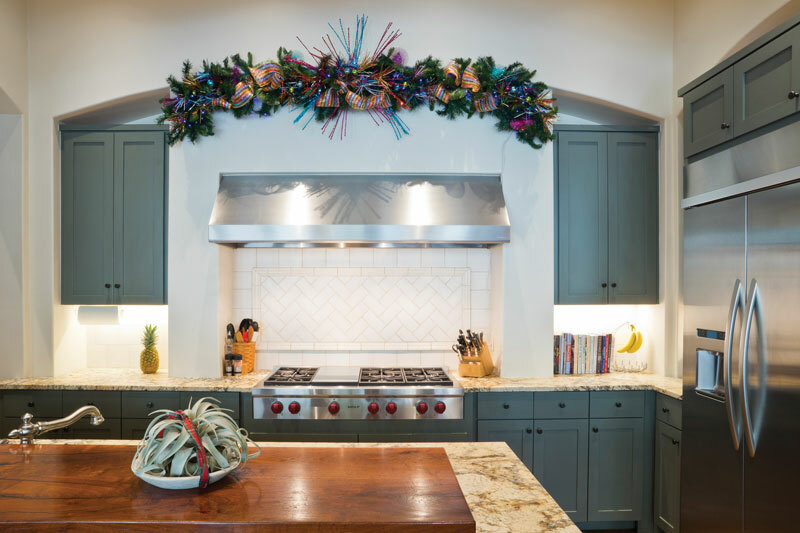 Kitchen, Honed granite countertops hold cooking utensils and recipes at the ready for holiday delicacies both savory and sweet. Caught in the whirlwind of the holidays, a savvy Alamo Heights couple give holiday staging “creds” to decorators Alex Perez and Tim Little of Texas Luxury Interiors for creating a sophisticated winter wonderland for Christmas entertaining. Seating Area, Six oil paintings of landscapes and villages purchased on a trip to Italy add warmth to a relaxed conversation area. A contemporary custom-made rug anchors a sitting area in the great room with Lillian August armchairs covered in creme textured and embossed leather. The coffee table is of wrought iron and cut stone. 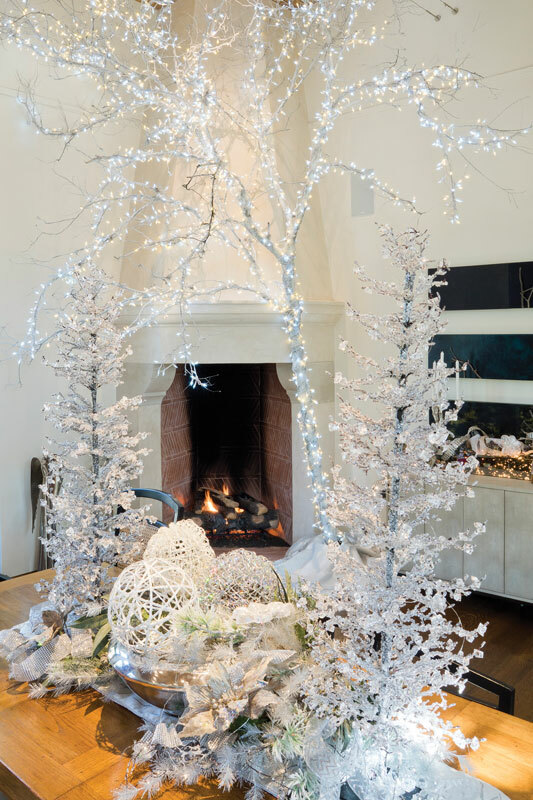 The clients, who collect contemporary works of art, asked for a minimalist look that would allow the art to dominate the holiday décor. The breathtaking gold, silver and white installations that dominate the public spaces were kept very clean, taking cues from the modern setting. Originally from the Midwest, the energetic couple searched for a suitable home in many of the city’s ‘burbs before settling in Alamo Heights. 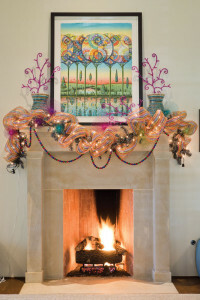 Fireplace, Artwork purchased from the Southwest School of Art’s Fiesta Art Fair adds whimsey to a colorfully festooned and illuminated limestone fireplace surround and mantel. Putting her talented touch to their contemporary home, the ambitious Internet shopper resourced Houzz, scrolling through rooms for most of their new furnishings. “I am an online search person; I am a sleuth,” she quipped. 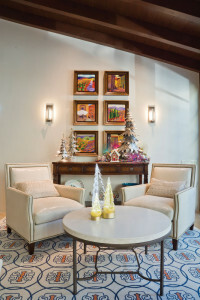 She also found a decorator online – Martha O’Hara from Minneapolis – who worked from an Austin showroom selecting new lighting fixtures that would illuminate spaces while integrating the old with the new, bringing scale and proportion to their home. Just off the newly renovated kitchen, a well-stocked wine bar has holiday libations at the ready, while a wine cellar stores bottles for future soirées. 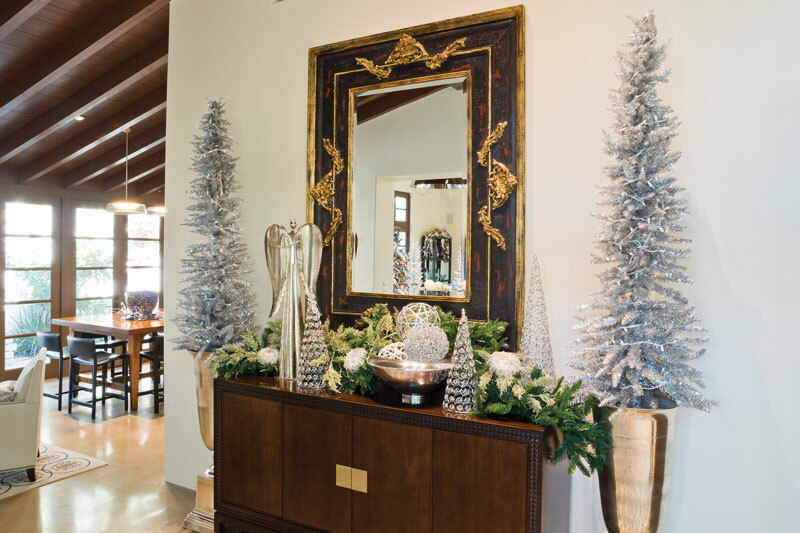 Entry, A glided and hand-carved wooden mirror, purchased in Atlanta in a favorite shopping spot, is nestled in an array of resplendent Christmas trees, orbs and angels of crystal beads, silver and gold flanked by a pair of holiday topiaries in metallic gold ceramic urns. 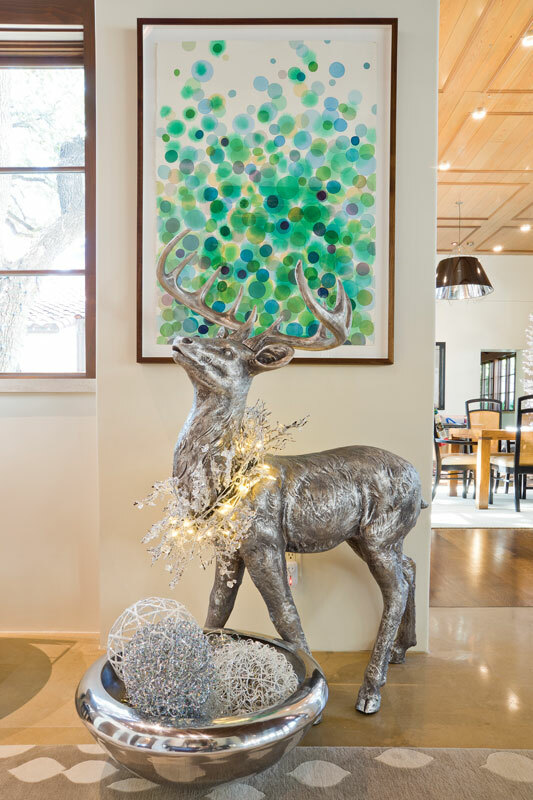 Silver Reindeer, A contemporary work by Jan Heaton from Hunt Gallery adds festive explosions of holiday green to regal reindeer welcoming guest to the holiday home. 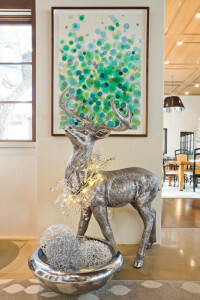 Just off the great room, a patio decorated with illuminated reindeer hosts a bar where guests enjoy a Texas Christmas outdoors. The home comfortably allows the party planners to integrate indoor and outdoor spaces, inviting conversation and dining to flow. Dining Room, A plaster and masonry corner fireplace adds a festive glow to a snowy scene of creams, whites and wintry hues of holiday wonder atop the wooden planked dining table. A cherished holiday occasion is forever remembered in a framed letter from the father of a young bride. Stationed in Virginia in the U.S. Navy in 1989, the young bridegroom invited all of his shipmates to join in the couple’s first Thanksgiving dinner. The novice cook did not know a thing about preparing a Thanksgiving meal for two, yet alone for a ship full of hungry mariners. Her father sent her a “how to” letter, describing in detail the meal’s full preparation.